It's a crisis with a twist. The Russian economy is collapsing, the ruble is near record lows, poverty is rising. But luxury car sales are booming. 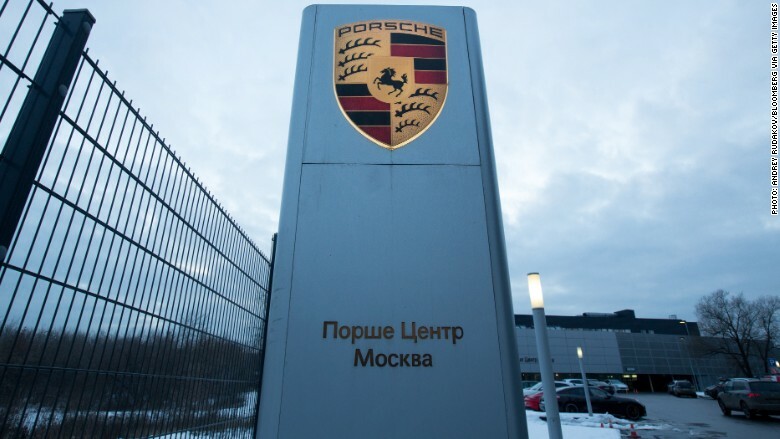 Porsche (POAHF) set a new record in Russia in 2015, with sales up 12.4% compared to 2014. Rolls-Royce also said recently it hit a new a record in Russia last year. Lexus sales were up 6% and Bentley said it's market in Russia is "growing rapidly." "The rich in Russia simply have more money and more confidence to make purchases," said Tim Urquhart, principal automotive analyst at IHS. The luxury car makers' success is in a stark contrast with the rest of the market in Russia. After a decade of fast growth, overall auto sales in Russia fell almost 36% in 2015. That's 1.6 million fewer cars sold in 2015. The boom in luxury car sales could be a by-product of the devastating economic crisis, sparked by the collapse in oil prices and Western sanctions. The weak ruble is making goods in Russia relatively cheaper for buyers who have most of their wealth stashed in dollars or other foreign currencies. The ruble has plunged to its record low of 82 rubles per dollar in January. It has since bounced back a bit, to around 77 rubles per dollar, but that's still really weak compared to the pre-crisis levels of 45 rubles per dollar. The huge drop in the ruble also prompted many Russians to spend before prices go up further. International companies adjust prices depending on exchange rates, but the process can take months and buyers are taking advantage of this delay. A similar rush to shop happened in December 2014, when the ruble first started collapsing. Apple was one of the first companies to adjust back then -- the price of iPhone 6 went from 39,990 rubles to 53,990 rubles -- a 35% increase -- within a week. But luxury car makers haven't made the adjustment. Take the Lexus IS. Prices start at $37,000 in the U.S. But buyers in Russia can get the same model for a little over 2 million rubles ($25,000). Some Russians were also looking to preserve their wealth as the ruble was collapsing. "Those who had larger amounts of cash were also looking for physical assets to move their cash into and some luxury cars fit the bill," said Urquhart.